The following collection of themes presents extremely flexible premium WordPress themes that are multi-purpose and can be used as platforms for developing any type of websites. Regardless of your niche, industry, or field these themes will focus and highlight your content. WordPress is also a great choice for webmasters because is free, well supported, and constantly updated. By using WordPress you can save a lot of time and money, while delivering professional and unique websites. Each of these themes is slightly different than the others and comes with its own unique elements. Make sure you check out all of them! Avaris is a gorgeous, enchanting, feature-packed, modern, and responsive WordPress multipurpose website theme. This premium theme is a great solution for webmasters because it provides an effective way of crafting modern and professional websites without writing a single line of code. 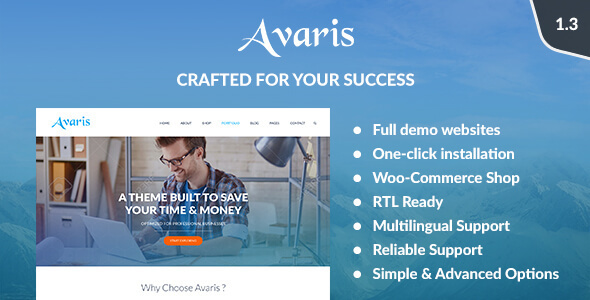 Avaris comes bundled with amazing pre-designed demos you can play with it and have a website in mere minutes. If you want to design something yourself you can use the theme’s dozens of design elements available with the drag and drop page builder included. There is no telling what you can achieve with Avaris, so go ahead and try it out! 3Clicks is a unique, creative, skillful, polished, adaptable multi-purpose WordPress website theme. It is packed with some of the best theme features and tools necessary for crafting impactful websites for businesses. Some of this theme’s features include bbPress integration, various skins, several menu styles, a potent admin panel, custom corner roundness, custom post types, fancy shortcodes, and more. Once you finish the website and are satisfied with it you can even contact the support team for a free design audit where the theme’s designer will give you some advice. What more can you ask for? Check out 3Clicks! 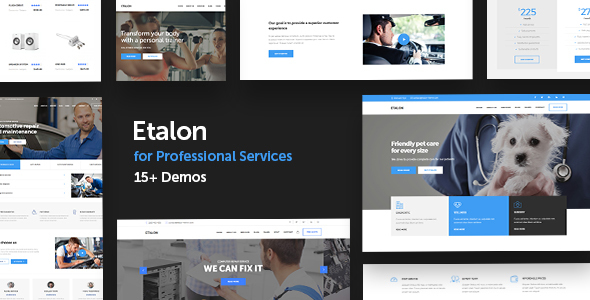 Etalon is a crisp, clean, fashionable, well-designed, and responsive premium WordPress theme perfectly fitting for personal and professional websites. More than 20 niche specific demos come with this theme which can be installed easily through the one click demo installer. Etalon has an impressive number of features and tools that can be used to create engaging and eye-catching pages. It includes a pop-up form, business profiles, opening hours, portfolio carousel, photo galleries, service tabs, testimonial carousel, pricing options, Visual Composer, Slider Revolution, and an extensive documentation. If you are searching for an easy to use theme with a stunning design, look no further than Etalon! 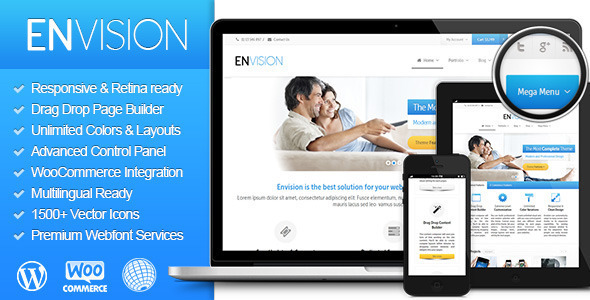 Envision is fully responsive, highly customizable, beautiful, powerful, and intuitive multi-purpose WordPress theme. It is perfectly responsive and adapts beautifully to any device and screen resolution. 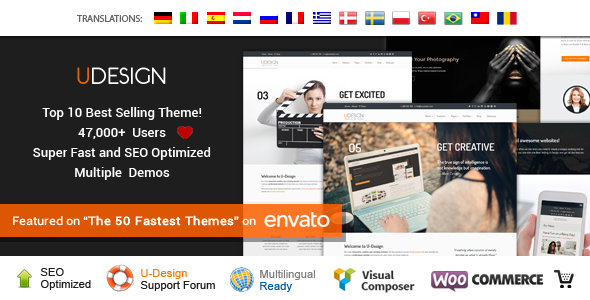 Envision is a truly competent theme that features a responsive and retina ready layout, an integrated drag and drop page builder, unlimited layouts and colors, a powerful admin panel, WooCommerce integration, translation ready, and vector icons. This is the right choice for you if you are looking for a professional and versatile premium theme. Jevelin is a beautiful, rich, stylish, refined, and extremely versatile multi-purpose WordPress theme. It is crafted as an all-purpose premium WordPress theme perfectly suited to enhance any type of website. You can tell Jevelin is suited for any type of niche thanks to its unique pre-built demos that come included in the theme. This premium multi-purpose theme is highly customizable, user friendly, and engaging. No matter what you have in mind, Jevelin can match it! Jupiter is an amazing, elegant, eye-catching, engaging, and mesmerizing multipurpose WordPress theme. It is professionally designed and developed by a power elite author on ThemeForest, and it currently stands proudly with a 4.72 stars rating. Jupiter is packed with over 140 pre-designed demos, a header customizer, background selector, lazy loading, edge slideshow, 100+ design elements, and more than 400 styles. Jupiter will adapt to any style, field, industry, and niche without a doubt. Be surprised by this amazing theme! 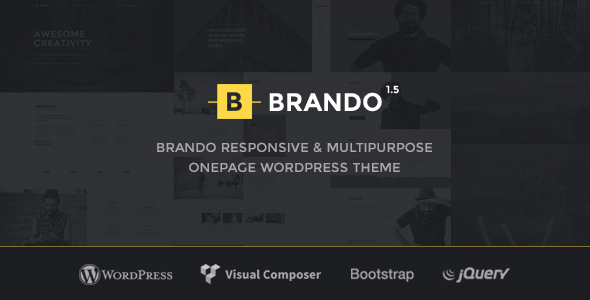 Brando is a sleek, striking, captivating, and highly customizable multipurpose one page WordPress theme. Brando is incredibly flexible and an amazing platform to craft sophisticated and stylish websites. Choose one of the 10 beautifully designed demos to get started and create a website in minutes. There is no need to have previous coding experience, as Brando gives you all the necessary tools to shape the theme however you want without writing code. Develop seamless and professional websites with Brando! 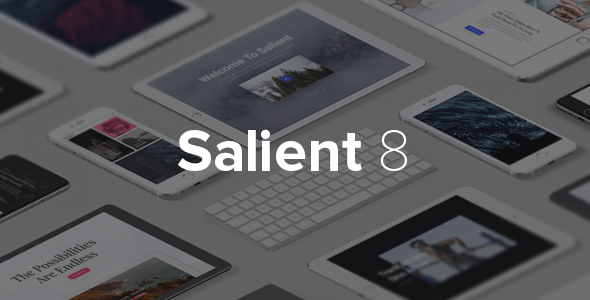 Salient is an eloquent, simple, clean, modern, easy to use, responsive, premium WordPress multipurpose website template. 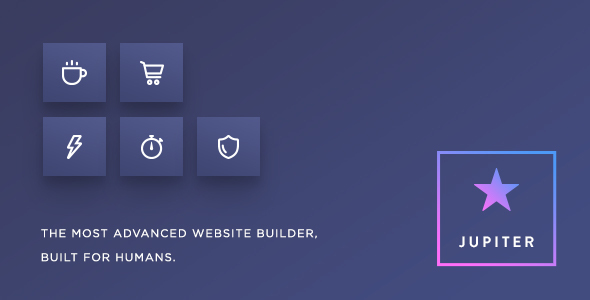 Salient is the perfect platform to develop unique and modern websites for a wide range of niches and businesses. Salient is easily customizable, highly intuitive, and comes with impressive features. With over 500 shortcodes and configuration options, many header layouts, amazing theme options, several styles for blog and portfolio, and smooth animations, Salient is one of the best themes currently on the market. The best thing about it is that it requires no coding experience to use all its features. River is an attractive, mesmerizing, highly customizable, robust, crisp, and professional premium WordPress theme. It is dedicated to all webmasters who are looking for easy to use and intuitive platform to build tasteful and visually pleasing websites. 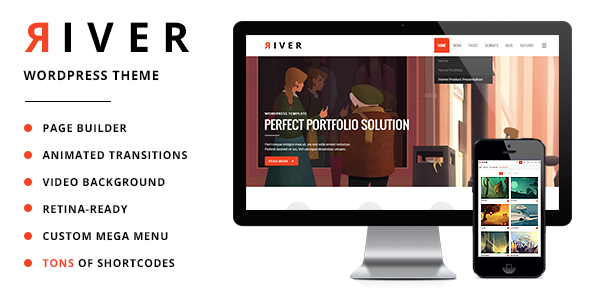 River has incredible potential and tons of advanced options such as customizable side menus, mega menus, customizable headers, Ajax animations, integrated Visual Composer, interactive elements, parallax pages, just to mention a few. Try River today! Enfold is a visually stunning, sophisticated, reliable, easy to use, modern, WordPress multipurpose website theme. Enfold is a resourceful and versatile theme so regardless of the niche you will be able to craft a simple, elegant, and modern looking website. 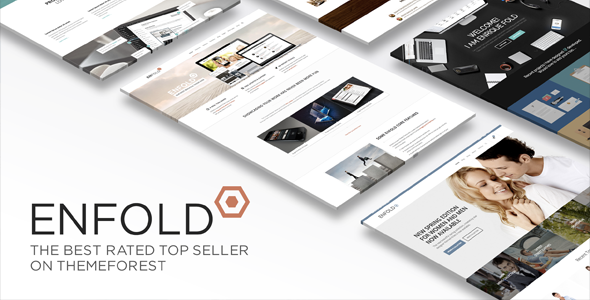 This theme will never go out of style because Enfold is constantly updated and packed with amazing trending features or tools suggested by clients. With Enfold you get various pre-made demos, amazing core features, outstanding support, an included page builder, potent admin area, and much more. If you want to keep it stylish and classy choose Enfold! Ronneby is an effective, flexible, appealing, engaging, highly customizable, and fast-loading WordPress multipurpose theme. Ronneby is the ideal choice for creative individuals that are looking to craft a unique, eye-catching, and visually impressive website. 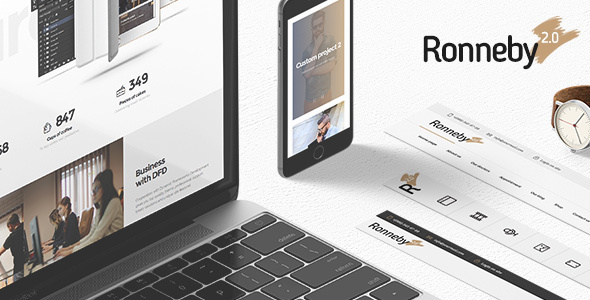 Ronneby features some impressive tools such as 40 amazing demo homepages, WooCommerce integration, extended blog and portfolio capabilities, translation ready, various shortcodes, premium plugins included, and a full responsive layout. Choose Ronneby and it will be the last theme you ever buy! If your plan is to stun and appeal your visitors then Bridge is the perfect theme for you. Bridge is a feature-packed theme with an intuitive, modern, and stylish design. 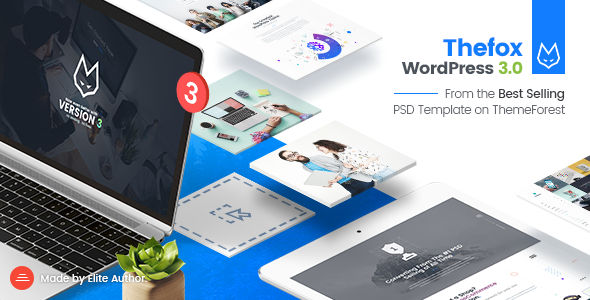 This creative theme comes with an impressive array of key features ranging from over 200 pre-made full demos, included premium plugins, useful shortcodes, timetables, Google fonts, infographics, blog post sliders, customizable mega menu, and more. Bridge is also fully responsive, so no matter where your visitors are or what platforms are using they will be able to access the website. The7 is a clean, elegant, modern, versatile, responsive, and highly customizable multi-purpose WordPress theme. The7 aids in the creation of stunning, intuitive, and fast loading websites in any niche, field, or industry. The7 is ready to impress you through its features and capabilities. Packed with 6 free premium plugins, 31 pre-made website demos, 750+ theme options, unlimited headers, SEO optimized code, and much more. Increase your website and highly your content with The7! Stash is a fresh, clean, up to date, dynamic, and visually beautiful WordPress multi-concept and multi-purpose theme. It comes with a unique design and impressive theme features and tools that load fast and are extremely intuitive. Effective and easy development is what Stash was trying to achieve, and nailed it. Creating a beautiful and unique website is effortless and fast with Stash. 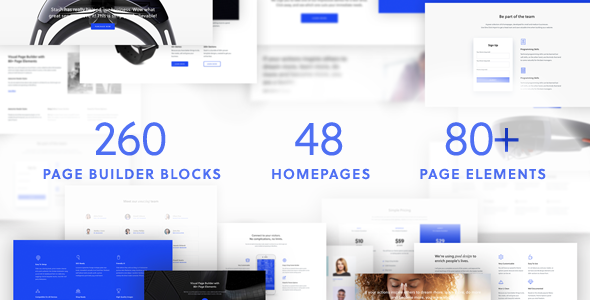 This theme comes with over 250 page builder blocks, 48 homepages, more than 80 page elements, 15 inner page templates, 7 ready portfolio pages, WooCommerce integration, and various free premium plugins. If you try Stash, you will not regret it! Sometimes you are able to say more with less, and Unicon does that. This is a stunning, clean, simple, and pristine WordPress theme with somewhat of a minimalist approach. Unicon is easy to install and set up and if you are pressed by time you can go with one of the beautiful pre-built homepage demos. The customization of pages is unlimited thanks to the integrated Visual Composer drag and drop page builder, as well as the theme admin panel. Despite having a bunch of features the theme remains highly intuitive and user friendly. Check it out! X | The theme is a modern, robust, user-friendly, attractive, effective, and fully responsive multiple purposes WordPress theme. This theme has been carefully developed to be an effective solution for webmasters around the world. The team behind this premium theme is always improving it and constantly releasing new updates. 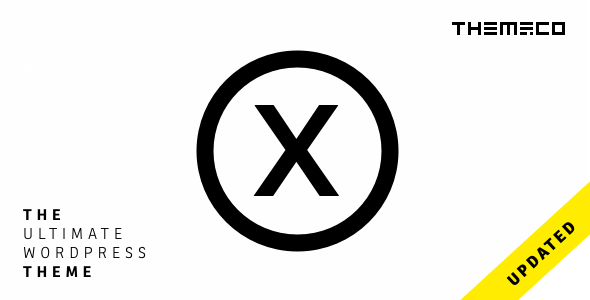 X | The theme is packed with dozens of demos, dozens of premium plugins, over 600 Google fonts, tons of shortcodes, several navigation options, and so much more. Give it a try! If you are looking for a complete multipurpose WordPress template that can take your website to a whole new level and highlight your content, then Uncode is the perfect choice for you. This theme has solutions and features for everything, and you will no longer have to worry about responsiveness, as Uncode adapts beautifully to any device. Uncode comes with some uniquely designed demos you can choose from, is impressively fast loading, comes with several premium plugins, module variations, an impressive media library, 6 menu styles, beautiful portfolio and blog layouts, and a dedicated support team. No matter your vision, Uncode gets it done! 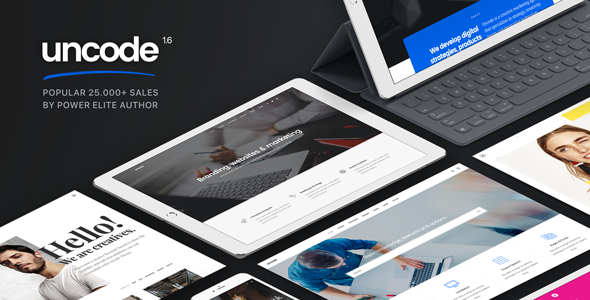 Porcelain is a modern, aesthetically pleasing, elegant, pristine, and refined multipurpose WordPress theme. Porcelain is also very resourceful and can present any type of content in a tasteful and professional way. It’s very easy to make this theme your own and bend it to you needs. Some of Porcelain’s goodies are Ajax galleries, custom header options, advanced content editor, parallax sections, font options, custom slider, and unlimited skins. Porcelain is very easy to use and intuitive and you can master this theme’s features without having previous coding experience. 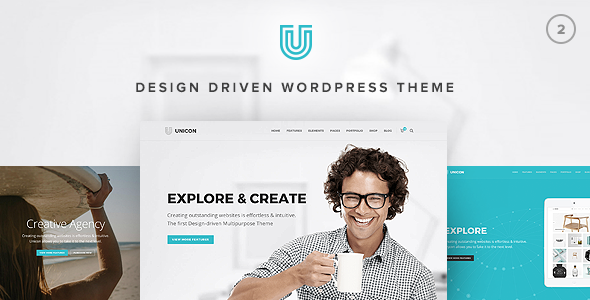 uDesign is a popular, professional, up to date, engaging, and gorgeous multi-purpose WordPress theme perfectly adaptable to any website thanks to its incredible design and versatile functionality. uDesign is SEO optimized, comes with a fully responsive layout, is integrated and compatible with WooCommerce, and has the option to import the demo content easily. The documentation for this theme is impressive and they have a dedicated team offering support 24/7. Bring your concepts and ideas to live with uDesign! H-Code is a robust, splendid, polished, refreshing, and responsive multipurpose WordPress theme. This theme is completely suitable for websites of all kind. Develop a unique website with H-Code thanks to its 31 multi-page demos, 26 one page demos, 6 intro demos, and more than 200 design elements and shortcodes. No matter the layout you choose, your website will look amazing and adapt perfectly to all mobile devices and platforms. Keep it simple and focus on the important things with H-Code! 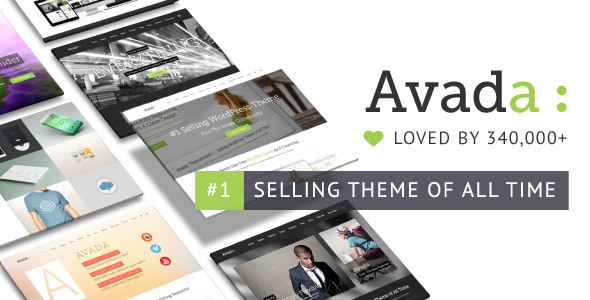 Avada is the best-selling WordPress theme of ThemeForest and it is not hard to see why. If you are looking to impress your visitors and make a great first impression then Avada is the theme for you. Its roster of features is truly incredible and completely intuitive. This theme is anyone’s best ally because it comes with the best demo importer on the market, dozens of pre-built complete demos, an advanced option system, an integrated Fusion builder, shortcode generator, auto theme updater, and CSS3 animations. No matter what you are looking for, Avada can provide it to you and exceed your expectations. 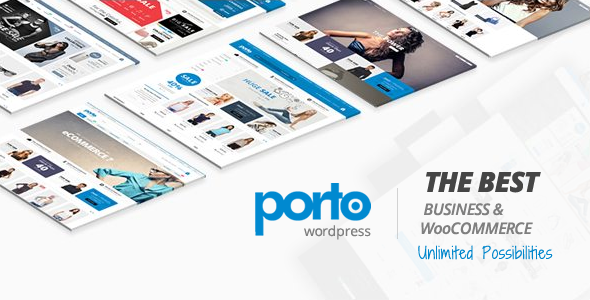 Porto is an elegant, clean, stunning, and up to date, responsive premium multi-purpose WordPress theme. This theme is extremely resourceful which makes it the ideal platform to deliver beautiful and modern websites. It is incredibly easy to make Porto your own and personalize it thanks to its advanced theme option panel, unlimited header styles, layout variations, mega menu, and Visual Composer. The top-notch support is always eager to help and will answer all your questions in the shortest time possible. Create an impactful site with Porto! 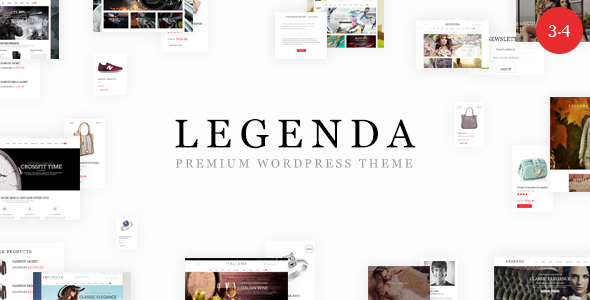 Legenda is a truly versatile and highly customizable WordPress theme. Legenda will adapt, improve, and craft the perfect environment for any professional or personal website. Legenda is equipped with useful and impressive features among which are various demos, Ajax filter, video product review, live chat, revolution slider, drop-down menu styles, premium page builder, catalog mode, and more. Legenda will handle anything thrown at you and turn it into a superior product. BeTheme is a sleek, gorgeous, reliable, creative multipurpose WordPress theme. 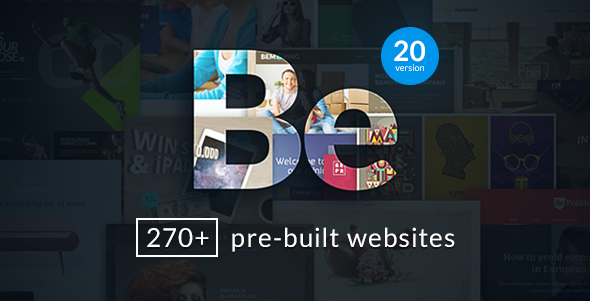 BeTheme was developed to raise the bar higher than the competition, and it succeeded. 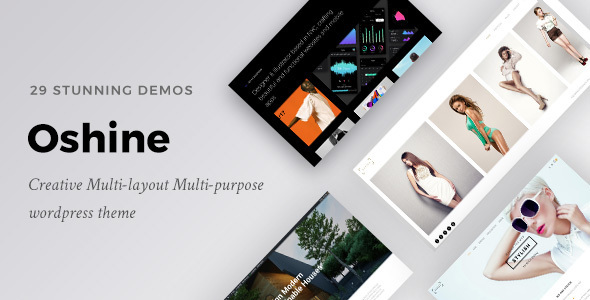 BeTheme includes 280+ pre-designed website demos perfect for any niche, field, and industry. 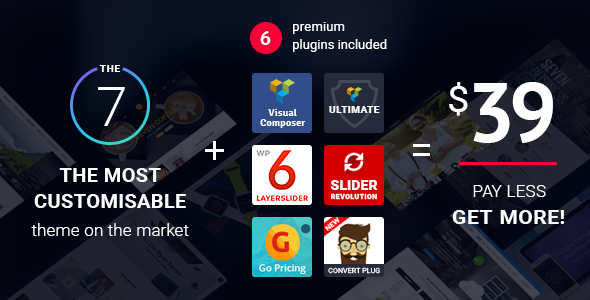 It is extremely easy to install and comes with various premium plugins such as Revolution Slider, Visual Composer, and Layer Slider. Create a memorable and eye-catching website with BeTheme! TheFox is a great-looking, elegant, robust, attractive, and user friendly WordPress multipurpose theme. You can tell that the developers behind this theme were ambitious and they managed to create an amazing product that can easily adapt to any type content. You can tell this theme is fully packed with amazing features from number of completely built demos and page layouts. Additionally, it also includes a couple of premium plugins for free, over 200 design elements, and a great documentation in case you get lost among all these features. TheFox is 100% responsive and cross-browser compatible, so give it a shot now! 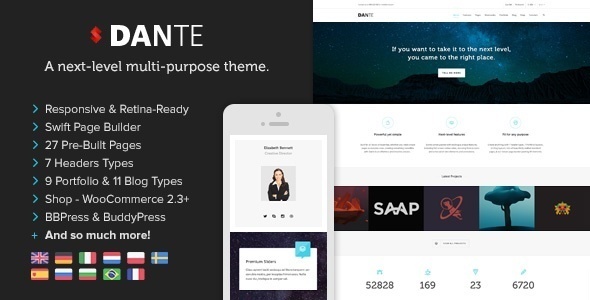 Dante is a stunning, modern, sophisticated, and highly customizable multi-purpose WordPress theme. Its design is clean, fully responsive, and cross-browser compatible. This premium theme comes with a bunch of fascinating features and tools including a swift page builder, 27 unique pre-designed page, 7 header styles, 9 portfolio and blog styles, integration with WooCommerce, bbPress, and BuddyPress. The latest update included the sidekick option which real-time guide inside the theme’s dashboard. This option is perfect for beginners. Oshine is a theme that focuses on showcasing your content, work, and portfolio in the best way possible. Oshine will improve every aspect of your website thus raising the bar for you competition. If you are just an average Joe without any previous coding experience, then Oshine is a great solution for you. Even though it comes with a bunch of tools and features, Oshine is highly intuitive and easy to mold to fit your style and vision. I recommend checking out the demo and see what you are missing out on! 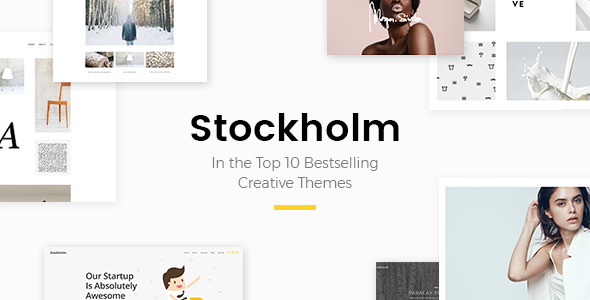 Stockholm is a beautiful, creative, multipurpose WordPress template that is crammed with amazing features and completed with a unique and clean design. You cannot go wrong with this theme regardless of the field you are in or previous experience in web development. Every single feature is there to enhance and add value to your website, so make sure to make the most out of them. With Stockholm you get for free Visual Composer, Layer Slider, and Revolution Slider to help you design something responsive and gorgeous. If you are in a rush you can choose one of the already designed and built demos, or use the advanced theme admin panel to create something yourself. Overall, Stockholm is an amazing theme and is worth checking it out. 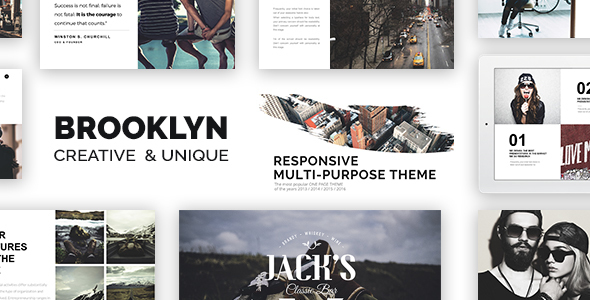 Brooklyn is a seamless, perfectly designed, fresh, popular multipurpose WordPress theme. Brooklyn is among the top 3 best-selling themes on ThemeForest because it is optimized to escalate your website to a different level both design and functionality wise. This theme was perfected along the way and now it is comes with impressive features that will surely exceed your expectations. It incorporates over 27 pre-made demos, a powerful admin panel, portfolio manager, pricing table manager, and is fully translatable. Your website will benefit from using Brooklyn and your visitors’ number will rise noticeably. 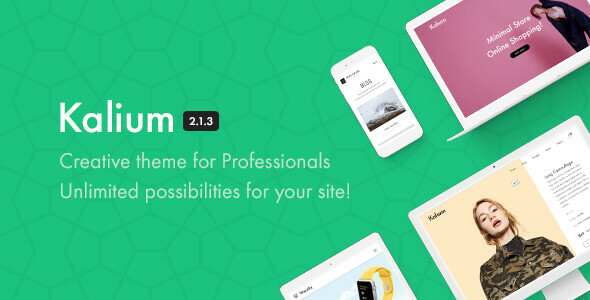 Kalium is the ideal multipurpose WordPress theme for creative individuals or businesses that want to showcase their portfolio. It is optimized to highlight your content and create a long-lasting first impression on your visitors. Usefulness is maximized with Kalium and contains only features capable of enhancing your overall experience as well as your users’. Installation is a piece of cake thanks to the integrated one-click demo importer, and you can choose one of the pre-made full homepage demos to get you started. Moreover, once you purchase Kalium you get a lifetime of free updates and bug fixes. Kalium has a preview available for those interested. This collection includes the top 30 most customizable multi-purpose WordPress themes available at the moment. We hope that you will find a good one for your website among them! If we missed any, let us know. 2019 © MachoThemes. All rights reserved. MachoThemes © is a trademark of Sigma Labs SRL.